Easter is just over 3 weeks away. If you’re like me, you like have some ideas for how to make sure your Easter celebration includes Jesus. I came across this fun idea that you could use to open up opportunities for conversation with your neighbours this Easter. It’s really simple to do and could give you a chance to talk about the resurrection with your neighbours. But, I’ve added a twist to the activity to make it a more substantial outreach. 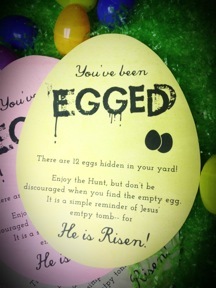 The idea is to secretly hide a dozen (or any number you want) eggs in your neighbours’ yards. Fill plastic eggs with chocolate or candies, purposefully leaving one of the twelve eggs empty. Leave a sign (you can download the template for free here) on your neighbours’ doors, inviting them to find the hidden eggs. In order to make this a more substantial outreach, I’d suggest either modifying the note that you leave on the door slightly to include some of the Minimal Facts about the resurrection (see below). Or, better yet, print out the text below about the Minimal Facts, roll the paper up and hide it inside the empty egg. That way you will get a chance to share some little known information with your neighbours this Easter. Did you know that the following facts about Jesus are so well attested to historically that even atheists who are knowledgeable in the field consider them indisputable? The tomb that Jesus was buried in was found empty. The disciples claimed to have seen a resurrected Jesus (and died for it). Jesus’ disciples began to believe in Jesus’ resurrection only after having seen Him resurrected. Paul (who persecuted the first Christians) and James (Jesus’ skeptical half-brother) both changed their minds and believed that Jesus rose from the dead when they saw Him alive again. The simplest explanation of these facts is that Jesus rose from the dead at Easter. If you haven’t already done so, make sure you check out our Resurrection Bible Study Part 1 and Part 2. It will help you to answer any questions that God brings your way about the Minimal Facts above or Jesus’ resurrection. ← What Causes an Athiest to Become A Christian?